Rule "Microsoft .NET Framework 3.5 Service Pack 1 is required" failed. "This computer does not have the Microsoft .NET Framework Service Pack 1 installed..." Similar error messages pop up going all the way back to SQL 2008 R2. 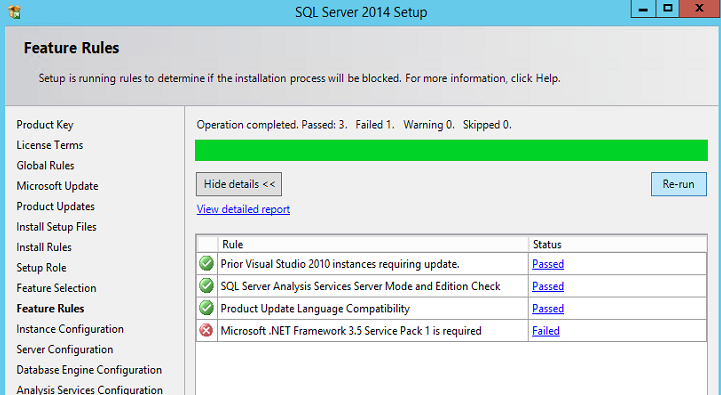 Before you go any further, click OK here but it is not necessary to abort SQL Server setup. Leave the "Feature Roles" page open, you'll be hitting "re-run" later. This support article goes through the various solutions, some more painful than others. 1. 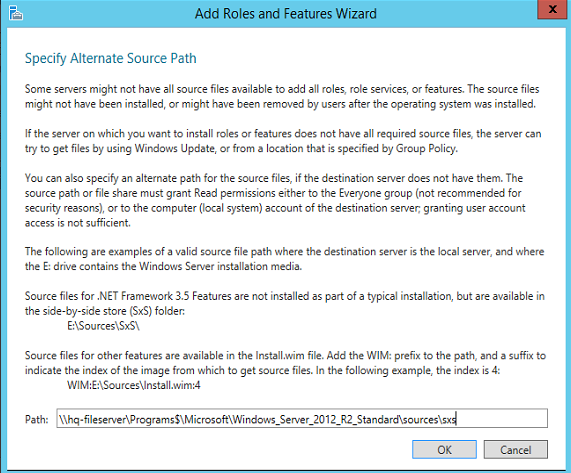 Extract the "...sources\sxs" subfolder from your Windows Server installation media .iso. 2. Run the below PowerShell, pointing at your extracted \sxs subfolder in the /Source syntax. Caveat- keep in mind that after installing .NET 3.5, you may now be eligible for additional Windows Updates/hotfixes that weren't there before. 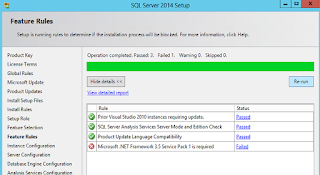 When complete, back on the SQL Server Setup window, hit "re-run" in the "Feature Rules" window and move on with your pleasant SQL Server installation experience. Then thank whoever should be thanked that you're not installing Oracle today. Irrationally uncomfortable or afraid of PowerShell? 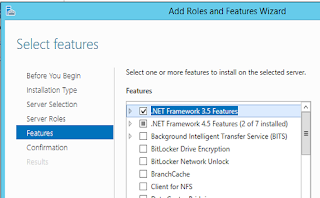 Yes, you can use the "Add Roles and Features" feature of Windows to add this, via the ".NET Framework 3.5 Features" Feature. You'll still need to do step one above to extract the "...sources\sxs" subfolder, only instead provide it in the Alternative sources dialogue box like the below example.